In the song, Dan & John are real coy with their intentions when they call up a woman, claiming they’d be all right with just watching tv with them. But that long hair and mustache tell you otherwise, ladies. They’re coming over to get it on. 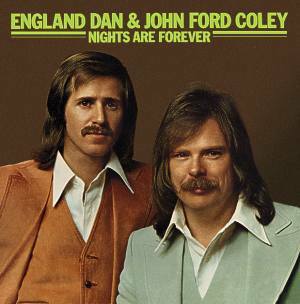 When my son or daughter asks me what the 1970s were like, I’ll simply show them a picture of the England Dan & John Ford Coley album above. Seems accurate. This entry was posted in Musician Steesh, R.I.P. Steesh and tagged dan seals, england dan, entertainment, i'd really love to see you tonight, john ford coley, Moustache, mustache, weakly veiled sexual advances on July 19, 2012 by Johnny Gerkins.